There's one thing bloggers love and that's flowers! And coffee!! I love having fresh flowers around the house to brighten up the room. And they just make me happy! I recently found this mobile flower truck, called Petals on the Go, in the Raleigh, NC area. 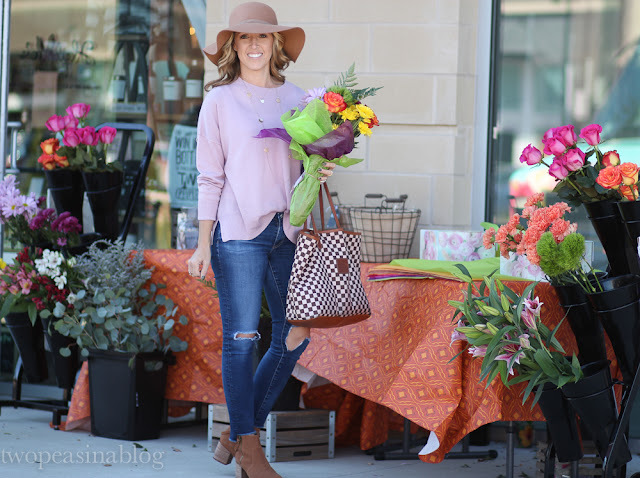 The owner, Amanda, brings the fresh flowers to you. They are fresh flowers, that she picks up that morning, so the quality is outstanding. You can either have her design a bouquet or you can pick out the flowers that you want. Truly a custom bouquet. She also gets seasonal flowers and offers special boutquets for the Holidays! Right now you can pre-order your Thanksgiving bouquets. Her truck can be found on the local streets, at businesses, and events. Check her calendar or Instagram for the schedule. I love this light weight sweater. It comes in 6 colors and is under $40. It meets my requirements for loose and comfy!!! I think it will also be perfect to layer under plaid scarves or jackets for cooler days. 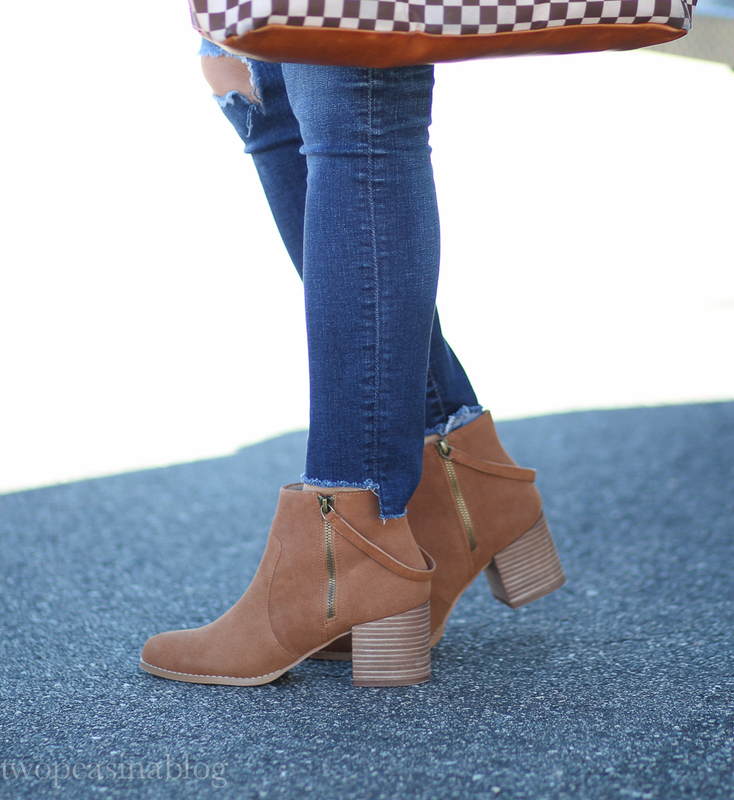 These booties are the newest to my collection and I love them. I had been looking for a pair that is the perfect shade of brown to literally go with everything. And these do!! I love the stirrup inspired zipper detail!! They also come in 3 other colors. 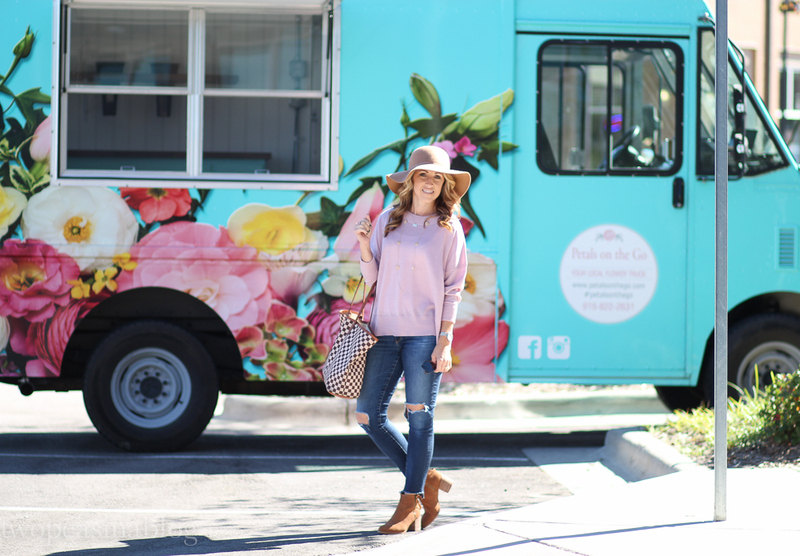 This week's feature blogger is Chelsea from Chow Down USA. Her blog is a mix of fashion, food and lifestyle. This outfit is totally Fall, and we love the details of her top!! Make sure you check her out!! Now for today's link up! These pictures are beautiful! 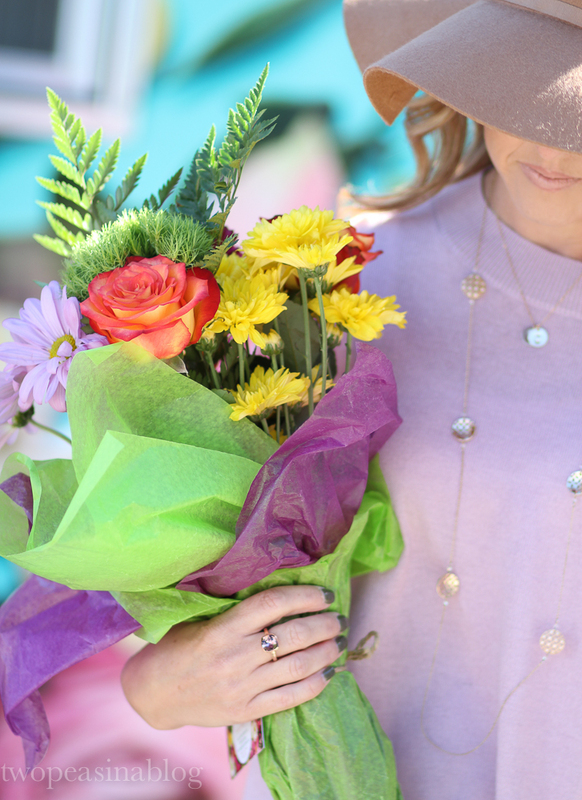 I love the color of that sweater, especially with the beautiful flowers to accompany it! What a neat idea for a business. I just bought a sweater in this color this weekend---it's such a great neutral and will go with so much!! And what a great concept for that truck! I love it! What a fun concert and you look so cute!! Such awesome pictures. Love your sweater and booties! Pretty as can be! Love the color of that sweater and this outfit just looks soooo sweet!! A flower truck??? How cool is that! It is so pretty too. Love this look. The color of your sweater is gorgeous. This look is so cute! The long, simple necklaces are beautiful. 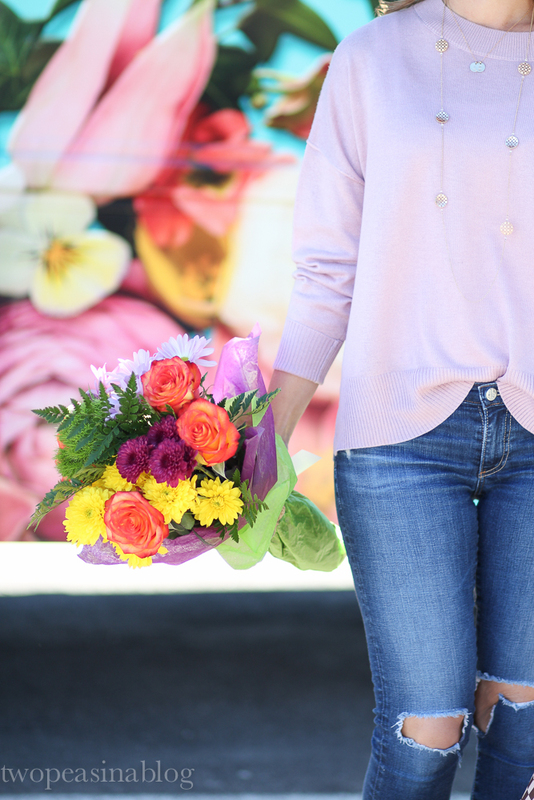 I love the pink sweater, and how beautiful are those flowers! 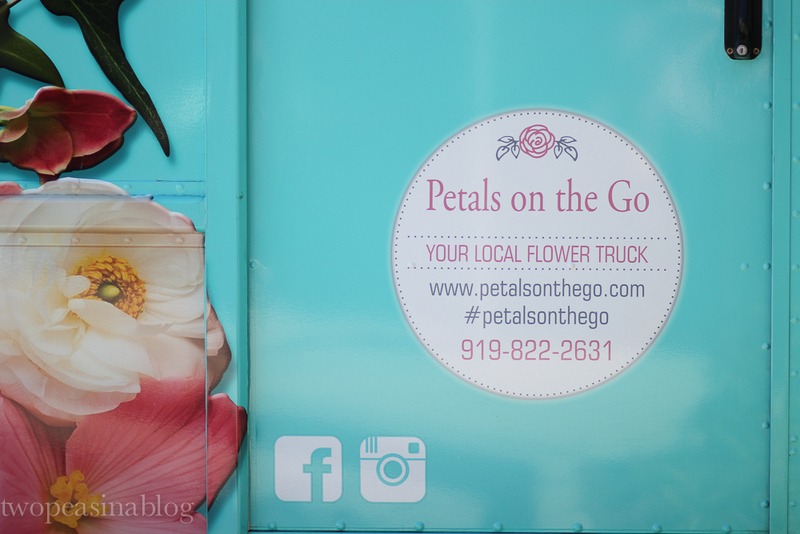 A flower truck is such an amazing idea! How pretty is this pastel sweater! Totally lighten up any gloomy weather. A mobile flower shop is such a clever idea! I always love treating myself to a fresh bunch of flowers. Stunning outfit, yes to florals and coffee and anything pink. What a great concept for fresh flowers. 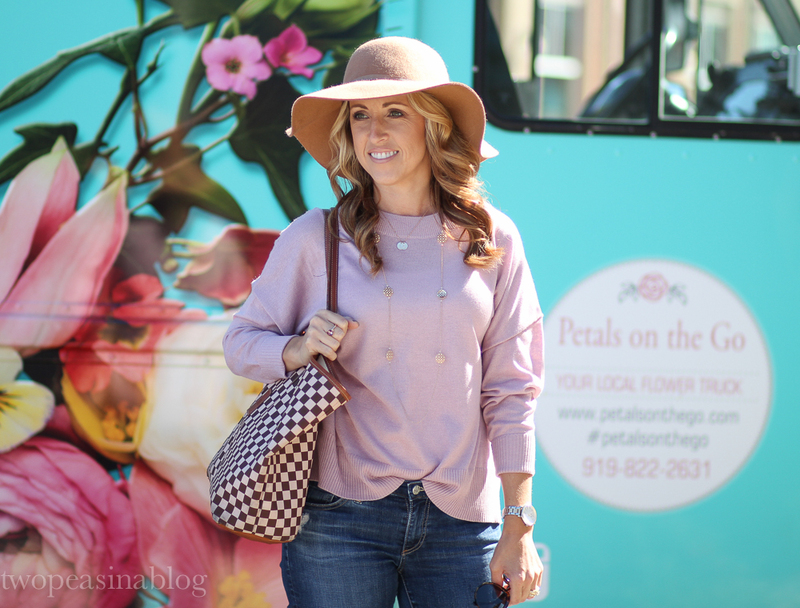 I love that on this post about flowers you wore a light rose pink sweater. And that hat is super cute on you!